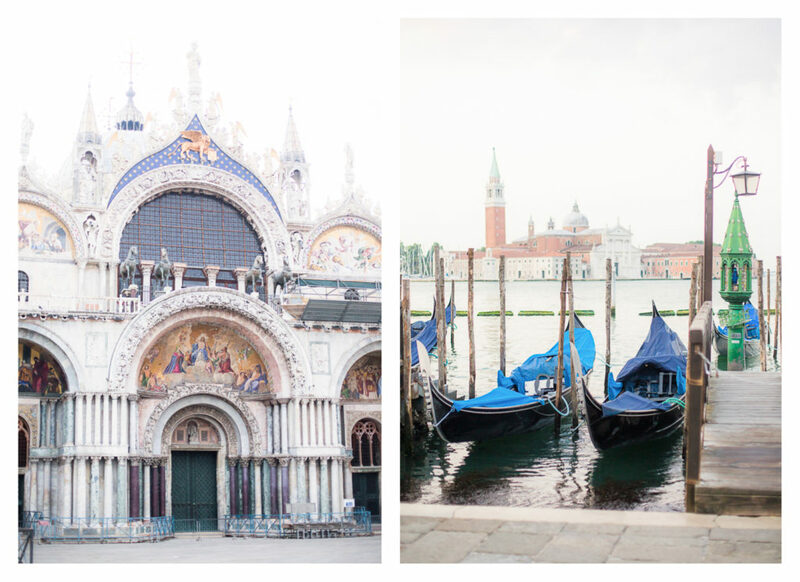 Yazmin & Vinh were engaged on a gondola in Venice, Italy. Vinh had hired a local photographer to capture the moment of the proposal, but the photographer never showed up! Yazmin and Vinh always wished they could have photos in this gorgeous city that was so special to them! I am so excited to share the images that came out of this session! This was just one of the reasons it was so important for Yazmin and Vinh to hire a Destination Photographer they could trust for their wedding day. We could meet in person over coffee and speak the same language! When Yazmin and Vinh planned their Wedding Day on Lake Como, they planned to stop for a special photo session in Venice along the way! With Venice being such a tourist destination, I asked if they would be willing to wake up for sunrise. They were totally down for whatever made for the best photos. Sunset would have had tourists everywhere. The shoot went perfectly. There was gorgeous glowy sunrise light. We were able to hit the most popular locations with beautiful light and no tourists! We took pictures in St. Mark’s Basilica Square first which has so many great spots. We made sure to take photos in front of the gondolas as that is where Vinh first proposed to Yazmin. Yazmin even had a gorgeous Venetian mask that I thought was so perfect for our session! Then we walked to the next big spot, the Rialto Bridge. Yazmin changed into this shorter gorgeous dress and pulled her hair down for a new look! My hair would not look that good after being up! At this point, the hustle and bustle of the big canal had began and one boat after another was sailing under the Rialto bridge. It was a really lovely atmosphere. Destination weddings are so amazing, as I am getting to take pictures at truly beautiful locations! I loved this final shot of Vinh picking Yazmin up in front of the Rialto bridge with these colorful columns all around!